Dear President Trump: What the Smallsat Industry Needs... A Spaceflight OpEd, By Curt Blake, President, Spaceflight Inc.
With a new administration in Washington, the growing smallsat industry is anxious to see what changes are on the horizon. After the end of the Cold War, the United States Military coined the acronym VUCA to describe the Volatility, Uncertainty, Complexity and Ambiguity of the world they now faced, which was forcing them to act differently and take decisions in ways they hadn’t had to before—fast-forward a quarter of a century and the term can be used to accurately sum up the current landscape of the satellite industry. North America—Leading the Market: A TeamCast Perspective, By Christophe Trolet, Satellite Business Unit Manager, and Mark Polovick, Vice President, Sales, both at TeamCast Inc.
From the early launches of GEO satellites (almost 30 years ago…), the US has adopted satellite communications as a strategic component of the nation’s infrastructure. Small satellites (smallsats) have become mainstream—large scale constellations are a promising next step. VSAT networks are arguably one of the most challenging satellite environments to manage, especially with respect to interference. The concepts of physical science cover everything that is, and that could be—the simplest theories, when translated into functional reality, emerge as the greatest success stories. Healing the Sick via Satellite: SSPI—Satellites Make A Better World, Poverty and distance are the enemies of health. In the rich world, high-quality medical care is usually a short drive away, because there are three physicians available, on average, to serve every 1,000 people. 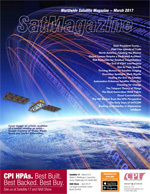 In 2007, Telesat merged with Loral Skynet, a US company with a strong technical background tied to the achievements of AT&T Skynet, Bell Labs and the Telstar program. 2017 has continued the dynamic industry trajectory of the preceding years. The Next-Generation WAN Fabric— A PCPC Direct Tech Focus, A solution is demonstrated that increases the effective bandwidth while increasing utilization. The movement of data across satellite communications has traditionally been low bandwidth with high latency and very low efficiency. In addition the cost per MHz of satellite bandwidth is very expensive. A satellite transponder can cost from $1.0M to $1.5M per year. The continuing onslaught of rapid technological advancements demands new solutions for data storage and transport. The North American market for ground-based satellite uplink equipment continues to be strong due both to new satellite projects and new technology being introduced. I just finished reading a LinkedIn article that listed three points to consider when contemplating SATCOM as a career path. While the points did have merit, I couldn’t help but flash back to the way things were long ago and ponder the contrast between what new entrants face nowadays and what we faced back then. The first Internet Service Provider (ISP) in Afghanistan was NEDA Telecommunications (NEDA), which was founded in 2003 and initiated their service for that country, starting with dial-up and moving swiftly into wireless broadband services.